Singapore's decision to ban open-loop scrubbing has come under further fire, this time from the Exhaust Gas Cleaning Systems Association (EGCSA). Like fellow scrubber advocate group Clean Shipping Alliance 2020 (CSA2020), EGCSA has expressed their disappointment at Friday's announcement, particularly due to a perceived lack of clarity over how the Maritime and Port Authority of Singapore (MPA) arrived at its decision and the fact the announcement came "without prior notice or discussion with the IMO despite the fact that the Singapore MPA is a signatory to MARPOL Annex VI." Outgoing MPA Chief Executive, Andrew Tan, said Friday only that the decision was made to "protect the marine environment and ensure that the port waters are clean." But EGCSA, who is among those who maintain that scrubber washwater is not harmful to the sea, suggest that the open-loop ban will actually be worse for the environment and Singapore's air quality. "The MPA provided neither scientific evidence for its decision nor was the industry invited to consultation. If there had been discussion, the Singapore MPA might have realised the high risks to human health resulting from the high toxicity of low sulphur fuels and more toxic distillates if no exhaust gas cleaning systems are used," EGCSA said in an emailed statement to Ship & Bunker. The IMO 2020 0.50% sulfur fuels are also expected to have less complete combustion, EGCSA says, which will mean "higher particulate matter discharge and poorer air quality in Singapore." The statement continued: "As the pronouncement by the Singapore MPA is likely to have a significant effect on crude carriers operating inert gas plant discharging into Singapore refineries and storage facilities as well as all other vessels visiting Singaporean waters, it is disappointing that the Singapore MPA has been less than open about its plans and has not, as far as we can tell, based its decision on proven scientific findings. "We would urge the IMO, national governments, port and harbour authorities to base any future decisions relating to the use of marine scrubbers, whether they use open or closed loop systems, on evidence and fact." EGSA also notes that ships have discharged washwater from open-loop scrubbers in the port area for over 50 years and around Asia various land-based power stations operate with open-loop scrubbers, all without any study showing measurable harm to the marine environment. 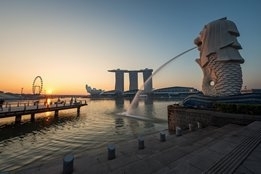 "As the Singapore MPA's announcement focused on open loop scrubbers, one conclusion that may be drawn is that there is a significant difference between the discharge from an open loop EGCS to the discharge from an EGCS operating in closed loop mode. What is not clear or published by the MPA is their assessment of the differences and consequent measured or predicted environmental impact," the association said. "The EGCSA welcomes dialogue and evaluation based on science and evidence." Ship & Bunker has contacted MPA seeking further comment on Singapore's open-loop scrubber ban. Australia may help to clear up effects of fuel oil pollution.